When people experience a Hong Kong Orchid Tree up close for the first time, they find it hard to believe that any tree could be covered with so many orchid-like flowers that fill the air around them with such a wonder fragrance. The vibrantly magenta colored blooms, up to 6 inches across, are usually seen from November through May, but can occur sporadically throughout the year. These beautiful flowers are sterile – they will not develop seed pods. Consequently, all Hong Kong Orchid Trees in cultivation are believed to have been developed from just one, that was found in China! Each of its progeny has been created by careful horticultural techniques – grafting, cuttings, or air layering. These lovely trees have quite distinctive, light-green, double-lobed leaves, which look remarkably like the wings of resting butterflies! Being semi-deciduous, many of these leaves will drop after the blooms fade – so, don’t worry if your tree looks a bit puny at times – it will soon be fully leafed out again. Interestingly, Hong Kong Orchid Trees are not related to orchids; they are actually legumes – and are related to common peas and beans. Being small- to medium-sized trees, they can grow to a maximum of 20 feet (with an equal spread), but are usually smaller. Careful pruning will create and maintain a full and symmetrical canopy. 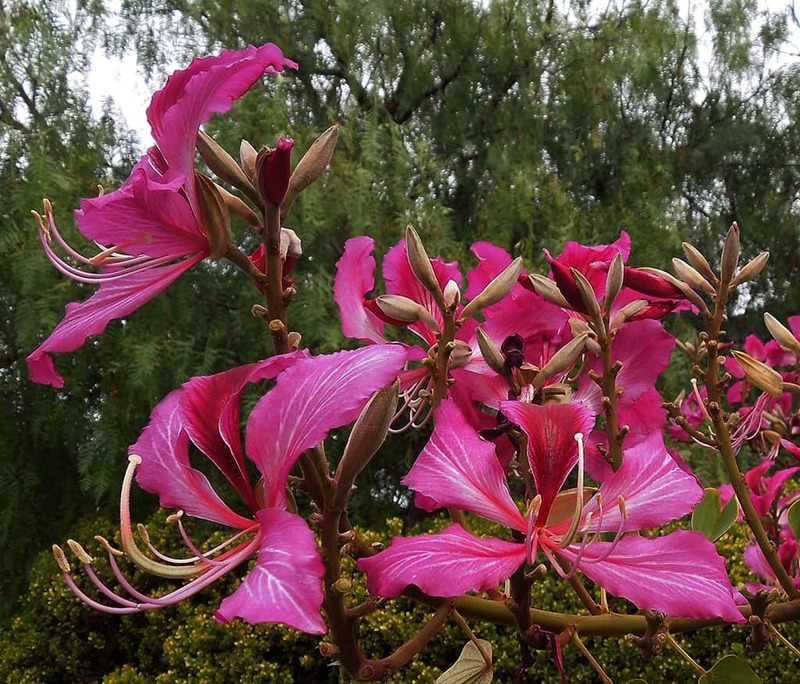 The botanical name of the Hong Kong Orchid Tree is Bauhinia ‘blakeana’. The genus name, Bauhinia, honors two 16th century Swiss scientists, Johann and Gaspar Bauhin; the specific epithet name, blakeana, honors Sir Henry Blake, the Governor of Hong Kong from 1898 to 1903. 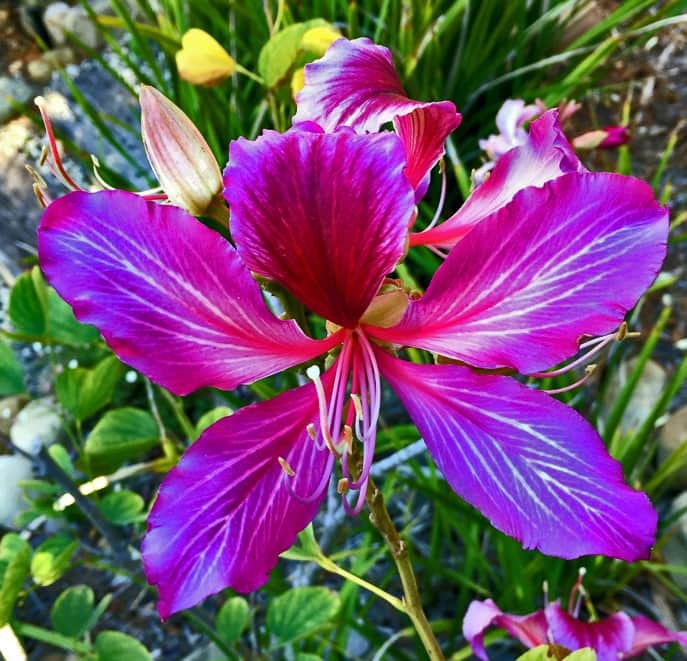 In Santa Barbara, three species of Bauhinia have been planted and appreciated for years: the Hong Kong Orchid Tree (Bauhinia blakeana); the Lavender Orchid Tree (Bauhinia variegata); and, the Brazilian Orchid Tree (Bauhinia forficata). Each are from foreign climes: Hong Kong Orchid Trees are native to China; Lavender Orchid Trees are native to Southeast Asia; and Brazilian Orchid Trees are native to Brazil, Argentina and Peru. 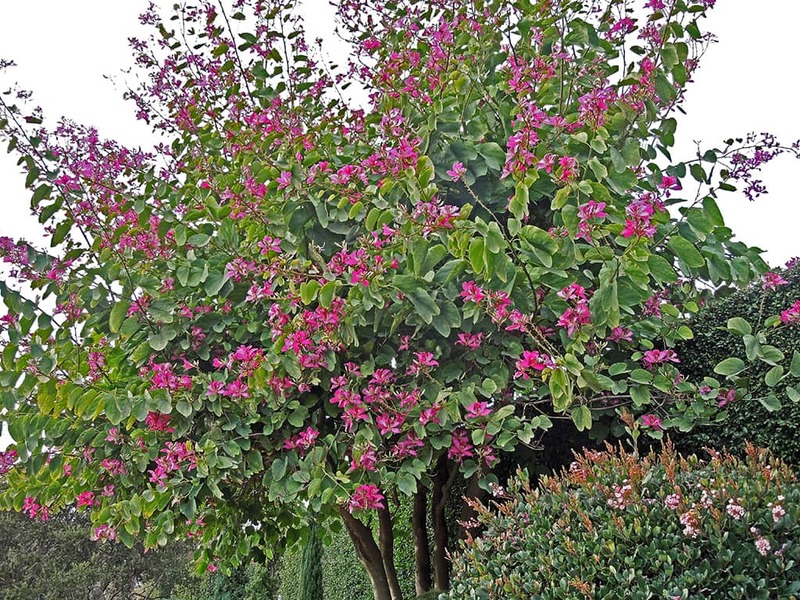 However, all Bauhinia do well in our Mediterranean climate, being fairly drought tolerant after they are established. Of course, they will benefit from regular irrigation. They do best in full sun and need to be protected from frost. Our local butterflies and bees love these trees. Hong Kong Orchid Trees, together with Lavender Orchid Trees, are street trees in the 700 and 800 blocks of Olive Street, the 100 and 200 blocks of West Islay Street, and the 400 block of East De La Guerra Street. Hong Kong Orchid Trees are also street trees in the 800 block of Spring Street and the100 and 200 blocks of East Padre Street. Notable specimens are in the 1500 block of Alameda Padre Serra, at the southeast corner of the County Courthouse, and at the southwest corner of De La Guerra and Olive Streets. Brazilian Orchid Trees are street trees in the 600 and 700 blocks of State Street; they will have white flowers in late summer.